Vice Chairman Peter Fraser and Martin Kennedy of NFUS announcing award winners at the Scottish Game Fair, summer 2018. The SGA awards season is almost upon us and we want to make sure you have time to nominate your chosen candidates in each listing. 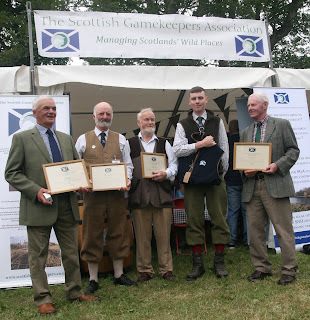 The deadline for nominations for the SGA Long Service awards is Friday June 7th followed by the SGA Young Gamekeeper of the Year deadline of Friday 21st June. Finally, the Ronnie Rose Award nomination deadline is Friday July 19th. Nominations in each award should be emailed to info@scottishgamekeepers.co.uk or can be phoned into the office on 01738 587 515. Long Service Awards are for individuals who have given 40 years or more of unbroken service to gamekeeping, stalking, wildlife management or as a ghillie on land or river. 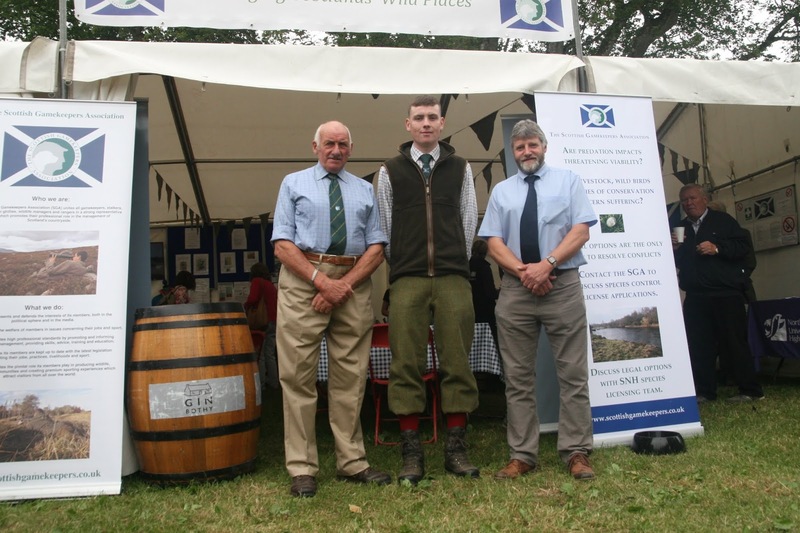 Young Gamekeeper nominees should be in the early years of their career, including in traineeship, and will have proven by their management, dedication and actions to be a youthful ambassador for the profession on land or river. 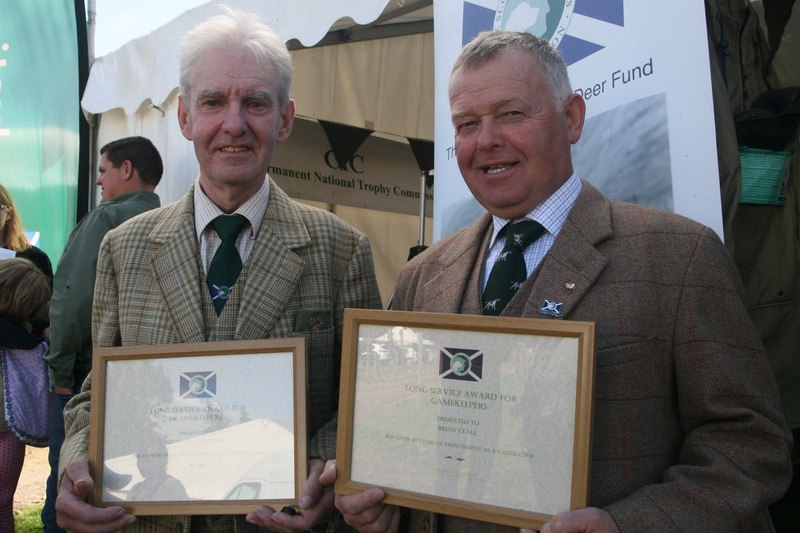 The Ronnie Rose Award recognises services to conservation or education on river, low ground, hill or forest. Wildfire at Loch Doon, Ayrshire- black grouse viewing points close by. With warnings of tinderbox conditions this Easter holiday, it is everyone’s duty to respect the countryside, ensuring our activities, whatever they are, do not become tragedies. 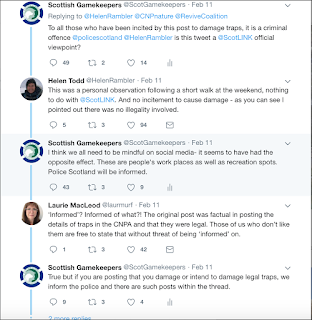 Gamekeepers almost exclusively have the finger of blame pointed at them when it comes to fires getting out of control in Scotland and, yes, it is true, muirburn fires do sometimes ‘get away’. Everyone who has lit a fire over the years will tell you that conditions can change unexpectedly. Thankfully, with today’s muirburn practice, better warning systems and collaboration, greater industry awareness, training and more equipment, being caught out is becoming less and less prevalent when it comes to strip muirburn practised by gamekeepers on grouse moors. That said, assess the comment threads on many social media posts (even in the last few days), and it is clear there remains a lack of understanding regarding the controlled use of fire in grouse moor areas and in the wider countryside. Indeed, public opinion, it would seem, starts from the premise that all out of control fires must be those’ bloody gamekeepers’, quite often followed by a call to ban something. For those investing much time and energy into doing things properly, following Scotland’s Muirburn Code, this is undeniably a source of frustration and The SGA receives many such messages and emails. This is, however, the modern world of social media, a world where misinformation can spread as fast as a Spring fire on dry ground. That aside, there is a need for the grouse industry itself to communicate better about muirburn, its benefits, why it is done and its role in preventing devastating wildfires. We can all do better when it comes to challenging misinformation, educating where appropriate or helping to inform a more rounded understanding. 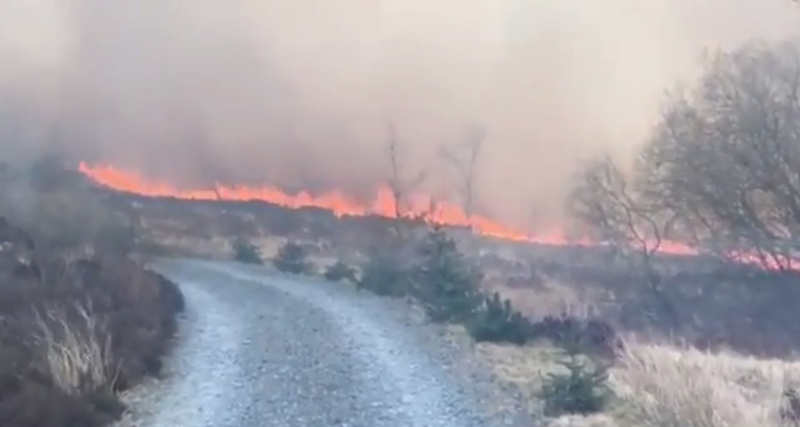 Statistics have emerged within the past few years, for example, where recorded fire ‘incidents’, which gave an impression -by the way they were recorded on a computer system- that the majority of these happen as a result of muirburn, whether on grouse moors or farmland. There is a big difference, however, between actual fires which required action by services and fires simply reported by the general public. This recording system is to be re-evaluated and qualified better and more news on this is likely to emerge soon. As the climate warms and fuel loads increase, the need to use fire in a planned way in the countryside increases. Skills, knowledge, equipment and training are of huge value to Scotland’s hard-pushed services and you only need to look to other countries to see the devastation caused by wildfires. Interestingly, the mitigation response in these countries has been to look to places, like Scotland, where there remains active fire use or a fire culture and to adopt techniques such as creating fire-breaks by burning selected areas of accumulating vegetation before wildfires can take hold. Most of the big UK fires we have seen over the past few weeks, where conditions have unfortunately been ripe, have not involved gamekeepers burning heather. 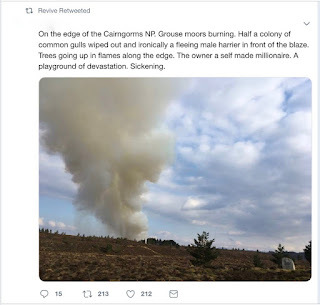 There have been big fires on grassland and gorse, crofting land, on nature reserves and land run by NGOs and environmental charities and partnerships. Domestic supplies have been cut, roads closed for public safety in Harris and people have had to temporarily leave homes, reminding us all of the power of fire. Sadly, knowledge of this has not stopped some from manufacturing issues around grouse moors while fire service workers have barely had the chance to look up, trying to tackle blazes ripping over kilometres of parched hillside. 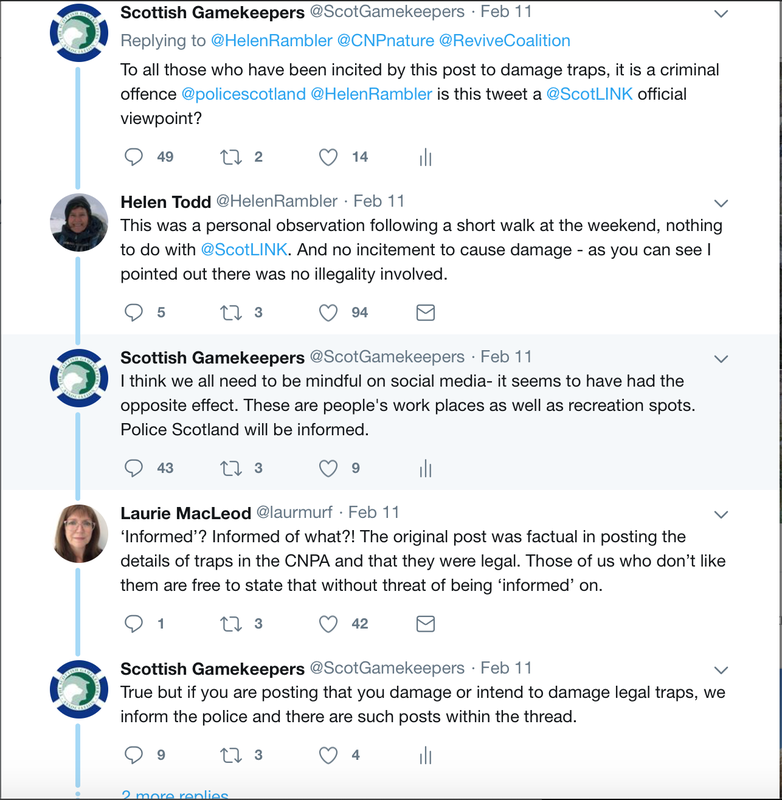 One tweet from an individual last week, for example, showed a picture of a distant fire within the Cairngorms National Park, accompanied with allegations that gull colonies had been burnt out - a wildlife crime (see image below). The tweet proved to be a gathering storm, shared by groups with known agendas against grouse moors and grouse shooting. It didn’t matter one bit that it was factually wrong. The fire in the photo was a muirburn fire on a grouse moor. However, it was a controlled, planned fire. Never at any stage was it out of control. It was managed by the gamekeepers on-site, using their own knowledge and manpower. No gull colony exists where the muirburn took place although those in the area do remember a historic black headed gull colony which moved on many, many years ago. Several years ago, a wildfire which started from this very ground, burnt out thousands of acres of the nearby estate and, with it, valuable breeding habitat for wildlife. With the un-managed heather again creating similar conditions for another big fire, putting in a number of fires to break up dense vegetation would be regarded as a sensible buffer against the potential for a much more devastating blaze. Furthermore, the same people implicitly blamed for the fire in the picture had actually put out a fire which did burn into gull nesting grounds just days before - a fire caused by a cigarette carelessly discarded by a member of the public. Indeed, had one of them not spotted it on the side of a single track road whilst driving and alerted colleagues, who put it out themselves with their own equipment, that gull nesting area would now have been decimated. Fortunately, it is too early for gulls to nest in that area. Regardless, it is easy to see how misinformation can be circulated and can spread. Contrast this with the fire event at Loch Doon in Ayrshire where kilometres of un-managed heather (heather where no muirburn or cutting/swiping has taken place, enabling fuel build-up) were scorched. Endangered black grouse lekking ground will have been lost. Protected pine marten breeding areas are monitored in nearby woods. Fires in these areas are now becoming, sadly, a regular occurrence. It is everyone’s responsibility to take care when accessing the countryside but not all fires are the same. Controlled, cool burns by gamekeepers, which create a mosaic of habitats for grouse, other ground-nesting wildlife, deer, sheep and hares are not the same as wildfires and not every out of control fire in Scotland is caused by ‘those bloody gamekeepers’. A little more light rather than heat over this issue will benefit everyone, whether you are accessing the countryside for recreation, trying to establish woodland, to rewild or are involved in economic activity with conservation spin-offs. Today, campaign group Revive put out a press release about muirburn accompanied by a film showing gamekeepers carrying out legal, well-managed muirburn. Here is the SGA response, in full. A Spokesman for The Scottish Gamekeepers Association said: “This is another orchestrated attempt by a group desperately seeking legitimacy to smear legal management activity; an activity, in this case, which has been scientifically proven to provide many benefits for red grouse, black grouse, deer and sheep and to prevent more devastating moorland wildfires like the recent one at Saddleworth, through the creation of vital fire-breaks. “Last week this group made unsubstantiated claims at a party conference about numbers of missing raptors. This week it is an attempt to create an emotive message out of legitimate moorland habitat management carried out by trained people guided by the Muirburn Code. Contrary to this attempt at media manipulation, the most recent published long-term study showed that rotationally burned moors promote the growth of sphagnum moss, essential for peat formation and carbon storage, better than un-burned moors. Dear members, we are happy to say that the SGA office networks will resume this afternoon (estimated to be around 12.30-1pm). Engineers have identified the fault, which has now been fixed. Thanks to everyone for their patience. All inquiries will be worked through by the office team as we get back online. Dear SGA members, we are writing to alert you that the systems in the SGA office are currently down. This includes both broadband and phone systems. Engineers are working to rectify the issue at present. We are really sorry for the inconvenience and hope to have everything back up and running as soon as the causes can be identified. 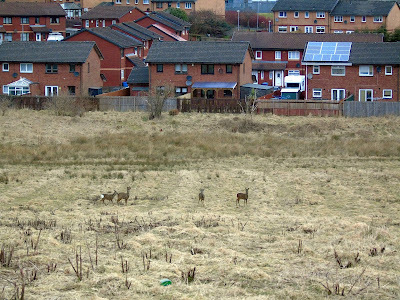 Urban Deer Photo credit: David Quarrell. 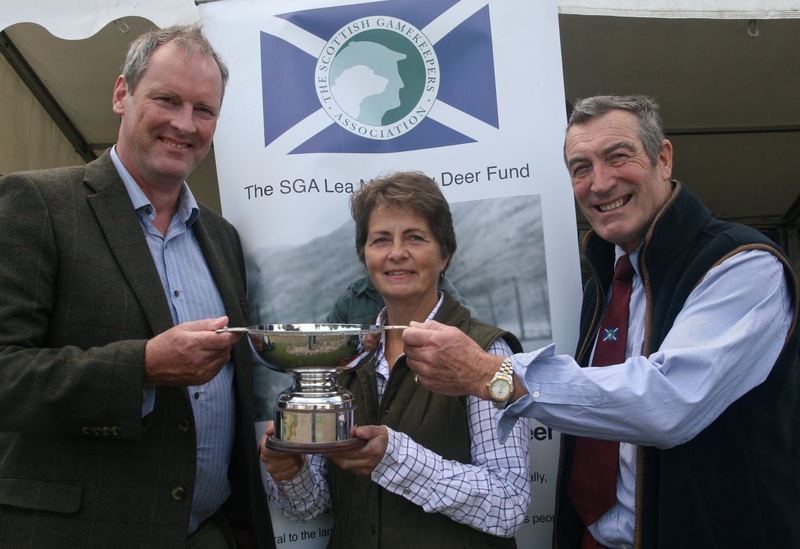 Calling all lowland deer managers who are SGA members. The SGA has committed to assisting the Lowland Deer Management Project Phase 2. This involves asking our Scottish lowland deer managers, particularly those in the G and FK postcode areas, to complete a 10 minute online survey (link at the foot of this news bulletin). SNH has identified a 950 sq km area north of Glasgow as the project area and the survey findings will help identify the extent to which current collaborative deer management approaches are delivering public interests. economic costs and benefits of deer management. More headlines from today's press at the foot of this story. Scotland’s gamekeepers have welcomed a new report investigating the economic and social contribution grouse moors make to Scotland’s fragile rural areas and marginal landscapes. The review, commissioned by Scottish Government and authored by James Hutton Institute and Scotland’s Rural College, looked at the economic and biodiversity impacts of grouse shooting. Authors acknowledged data limitations regarding both the grouse sector and possible alternatives, but acknowledged the importance of grouse shooting to local economies, jobs and in retaining populations. The biggest beneficiary regions were Aberdeenshire, Highland and Perth and Kinross. Grouse shooting is responsible for 2500 full time equivalent jobs with estates spending averagely £212 000 a year in wages and £515 0000 on suppliers per annum, reported the study authors. According to the report, most expenditure remains in Scotland; a study in the Cairngorms National Park showing that 89 percent of staffing costs and 77percent of management spend occurred locally. One survey in the Angus Glens and Monadhliaths, referenced in the new report, stated that over a quarter of respondents in these two areas said their livelihoods were linked to grouse shooting. The report acknowledged that all of Scotland’s grouse moors are sited on areas of very poor agricultural ground, classified by the EU as being Less Favoured. 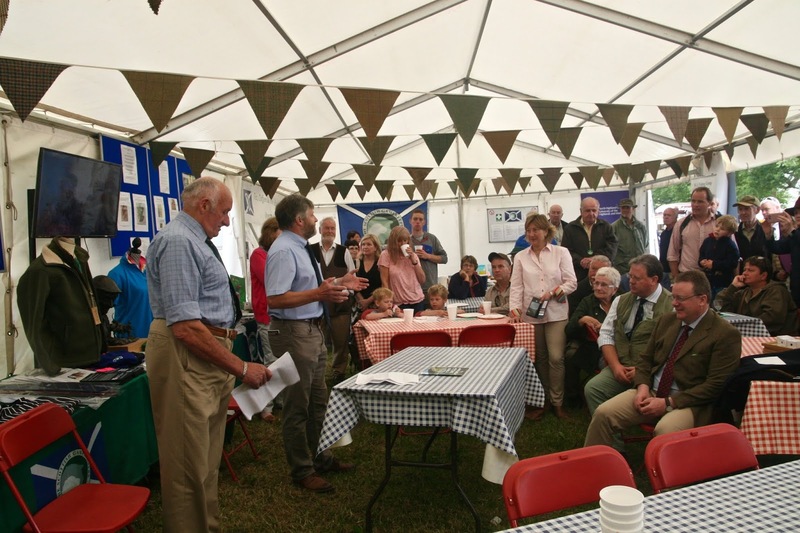 “There are clearly some knowledge gaps to be filled by Government before we get the full picture of upland land uses, and we are willing to help the process, but we welcome the work done so far,” said Alex Hogg, Chairman of The Scottish Gamekeepers Association. “The jobs created by grouse shooting, like gamekeepers’ roles, are important because they keep people in some of the most fragile and remote parts of Scotland where opportunities can be very hard to come by. There has been a lot of talk recently about converting grouse moors to other uses. This report brings a bit of reality regarding the constraints, one of the biggest being finance, although there are many others. According to the report’s authors, there is currently no direct government subsidy support for grouse shooting in Scotland although some moors can receive the same grazing payment as sheep farmers, if livestock are grazed on the hills. Many grouse estates today are integrated, with income also being derived from stalking, fishing, in-hand agriculture and renewables on the same ground, making it impossible to calculate how much of Scotland’s uplands are used solely for grouse shooting. The report considered alternative uses of upland marginal lands such as hill sheep farming, forestry, windfarms, rewilding and nature conservation. However, authors acknowledged that, whilst possible in certain circumstances, alternatives were constrained by regulations, geography and climate and a heavy reliance on tax payer subsidy. “Some alternatives (eg. farming, forestry and renewables) are heavily reliant on public payments to justify the activity economically, with others (eg: rewilding, conservation) more reliant on the benevolence of owners of members,” the report stated. According to their 2018 accounts, RSPB received £19.8m of tax payer funding in the UK, equating to over half of the £38.2 sum it spent managing its nature reserves. Other headline statements from the report. Knowledge Gaps and the need for longer term studies: “The narrow evidence base and inconsistency in data collection approaches mean that evidence on socio-economic impacts is open to criticism. Some of the methodological criticisms are not unique to grouse studies and indeed often apply to sectoral economic impact study approaches. “There is limited evidence on the socio economic impacts of alternative land uses on moorland areas, particularly of the emerging rewilding and conservation approaches being taken on some private estates." “There is a paucity of evidence to say that negatives from grouse moors impacts on the £187 m brought in from bird watching and wildlife tourism country-wide. Similarly there is little reported on the social or cultural aspects of alternative land uses." Is forestry an alternative to grouse moors? “Indeed GFA-RACE and Macaulay (2003) suggested that “the financial viability of afforestation of moorland and moorland fringe areas, even with existing public financial support, is doubtful. The pressure of greater environmental constraints has increased this position, and therefore this option has not been revisited in any depth. Whilst the economics of forestry and woodlands have improved significantly since 2003 the hard fact remains that there is limited scope to plant grouse moors due to regulations and poor quality of land. There are limited published details of the costs and returns of planting moorland areas." Land Capability for Forestry is also typically low, for the holdings with grouse butts present. "Indeed, the areas considered unsuitable for trees with any expectation of delivering harvestable timber are substantially greater than the areas considered as having very little agricultural value." Is hill sheep farming a viable alternative to grouse moors? "While change to an exclusive use of this land as unimproved pastures could be feasible it seems unlikely to be viable given reduction in stocking of hill land since decoupling of CAP payments in 2003. Creation of permanent pastures is likely to be prohibitively costly and may conflict with the desires of the proprietors and with designations." What about rewilding and conservation? 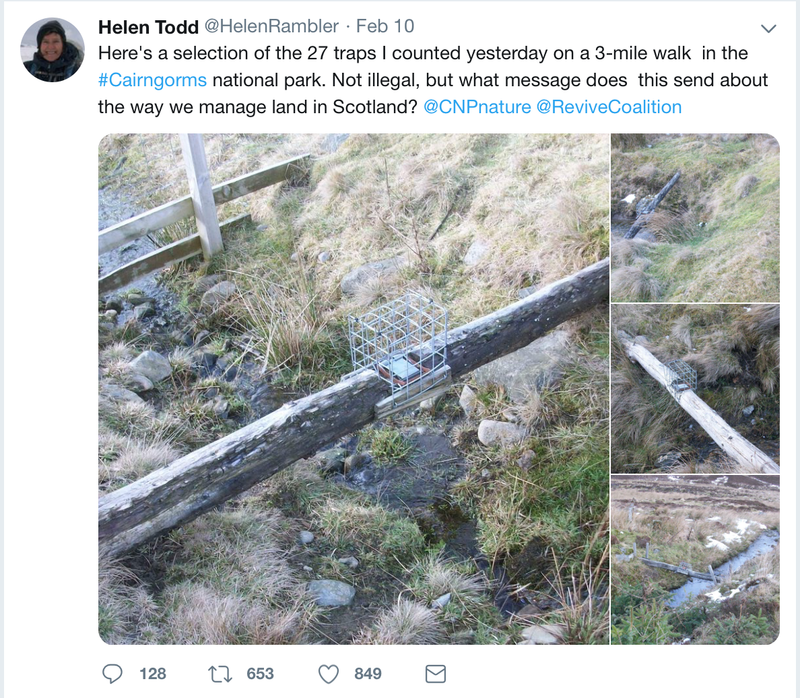 “Recognising that the socio-economic impacts of alternative land use are not comparing like with like, and there are biophysical, landscape, or designations restrictions of replicating them across all Scottish moors. It should be noted that each of these land uses is dependent to varying degrees on the public purse, with for example renewable energy, farming and forestry being heavily supported by the Government, whereas conservation / NGO land management often receives Government support as well as private membership support. What about Staff Wages and Management Costs? : "Park (2008) reported costs of £99,500 for maintaining the grouse moor at Langholm in 1996 (with very limited income from grouse over the same time period). Savills (2013) estimated the cost of employing a gamekeeper at £45,000 per annum (including housing, vehicle, salary and equipment) and the cost of running a day of driven grouse at approximately £2,500 (including staff time, catering, pickers-up and beaters’ costs and transport) – although this does not include capital costs of the supporting infrastructure, which is often considerable." Are there benefits for non-shooters in managed moorlands? “Whilst tourism often benefits from managed moorland (whether that management is for deer, grouse, woodlands or farming), it rarely contributes to the maintenance costs of Scotland’s rich landscape which people come from around the globe to visit. Grouse moors have been used as recreation areas in Scotland for decades, mainly for walking, but also to access mountains, and more recently for mountain biking." "In the surveys of the Tomintoul community (Mc Morran 2009) and Angus and Monadhliath communities (Mc Morran et al. 2015), a majority of community respondents used grouse moors for recreational or other purposes (e.g. work). A majority of community respondents also viewed grouse moors as attractive or extremely attractive in Angus (75%) and in the Monadhliath (60%)."